Adam Gilchrist may have announced his retirement from Test and One-Day International cricket after day three of the recent Adelaide Test, and his announcement might have suggested to us that he will hang the bat and gloves up after the Commonwealth Bank series in Australia this summer. But are we really about to see the last of the greatest wicketkeeper batsman the world has ever seen…? I don’t think so. After watching him wield the willow in a warm up Twenty20 match against India last Friday night, in front of a lazy 84,000 cricket crazy Victorians, I got the feeling he was completely and utterly in his element. Not even a well directed Tait bouncer could have wiped the grin off Gilly’s face that night at the ‘G'; he was loving every minute of it, and why wouldn’t he? This version of the game seems to be made for him. 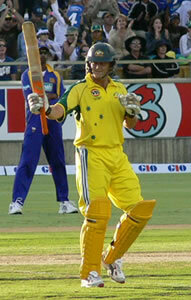 Just 2 hours before Gilchrist was due to do battle in this twenty20 against India, he held an interview with an Adelaide radio station. When asked during this interview if his wife Mel was excited about the prospect of him being home more often, his response was, “well it hasn’t happened yet and we’ll just have to wait and see what happens”. It’s been heavily reported since the infamous and emotional retirement announcement: Gilly is now free to participate in the new billion dollar Indian Premier League (IPL) Twenty20 series set to begin in just weeks, which has seen corporate giants shelling out more than US$800 million to secure 8 franchise teams for the next ten years, and in which the television rights have only just been sold for a staggering US $1 billion. But what has not been so heavily reported is the IPL might have a problem securing our Gilly as a marquee player for their tournament. When this article was written, set in place is a two-year ‘cooling off’ period post retirement for a player to become eligible for the league. This was set up to stop the temptation for players to pull the pin on representing their country, andor retiring early just to secure lucrative IPL contracts. There is nothing finalised on this little dilemma yet, and desperation is set to move in as main draw-card players like Ponting, Symonds, Gayle and Pietersen are now dropping out of the race to fulfill commitments to their respective countries. I for one can’t wait to see what tactics the IPL employ to get around this little snag to ensure Gilchrist lines up. Still, going on recent events in Australia, you wouldn’t think the IPL (designed and backed by the BCCI) would have too many problems getting around something like this. And whilst having zero respect for the way the BCCI negotiated Steve Bucknor off, and Harbhajan Singh on to the park this Australian summer, I do hope they dream up one more bullying tactic to slice through the red tape, enabling Gilly a shot at being a part of this incredible twenty20 cricket tournament. Because if the IPL get their man, and if this man is given a license to thrill without the pressures of performing for his country, and with the sound knowledge that his wife and bank manager are smiling, then I think we are all in for a very special treat when we tune in to watch Gilly play the game that he has dominated for the past decade, in a version that seems tailor made to exploit his countless strengths.